I came across this video which I thought was a pretty nifty homemade canopy. Canopies are an item which can be a real blessing to have. They can help shield us from the hot sun and even offer some protection from rain. I have a friend who slips a large plastic bag over his to make it totally waterproof if he has to deal with rain while out riding. Some people make their own canopies. My friend made his and another friend made his. There are only a few manufacturers of canopies that I know of. Prices range considerably as do the design and build. I have written about CANOPIES before. One manufacturer I know of (Ed Miller) offers several options on his canopies. The other canopy manufacturer I have written about before (Andy Vardik) no longer makes them. There are a very few companies around who offer them. One of them is Recumbent RagTops. 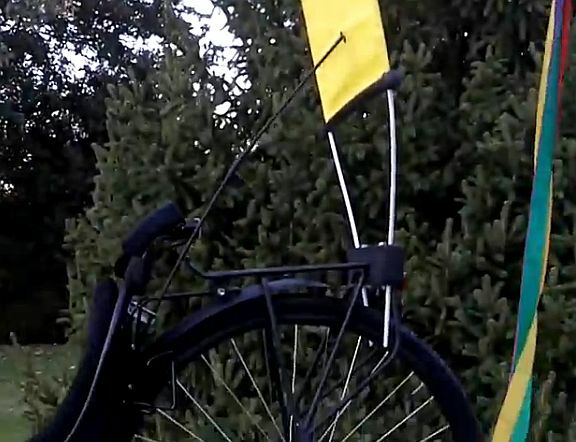 There is also VelTop which offers canopies for recumbent bikes and trikes. 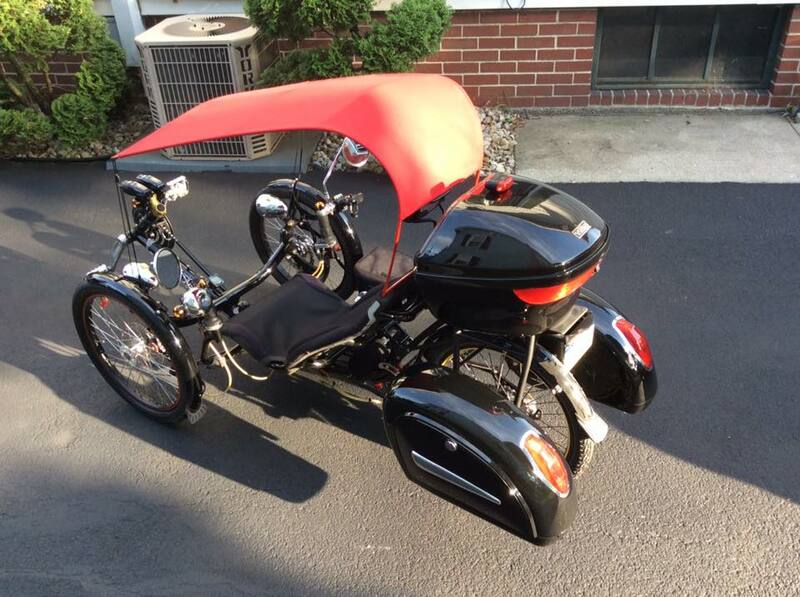 This posting is featuring Recumbent RagTops as I have never written about them before. In other words all they supply is a hunk of plastic. You are on your own when it comes to mounting it. That has no appeal to me. If I buy a product for my trike I expect it to come with whatever is needed to use it on my trike. I am not at all impressed with what I see on this website. 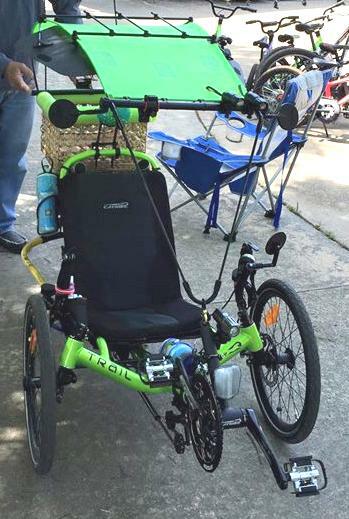 They don’t even have the canopy mounted on the trike they are using to display their product. Instead the guy sitting on the trike is holding the canopy in place with his hands. It is not even centered on the trike when you look at the front view. That seems very unprofessional to me. There it is folks. Just selling a piece of plastic that one has to figure out how to mount. Nope, I ‘ll pass. I would expect most people would. They need to offer mounting hardware if they are going to sell this product. I wouldn’t know where to begin to come up with what would be needed nor would I want to. How about you? 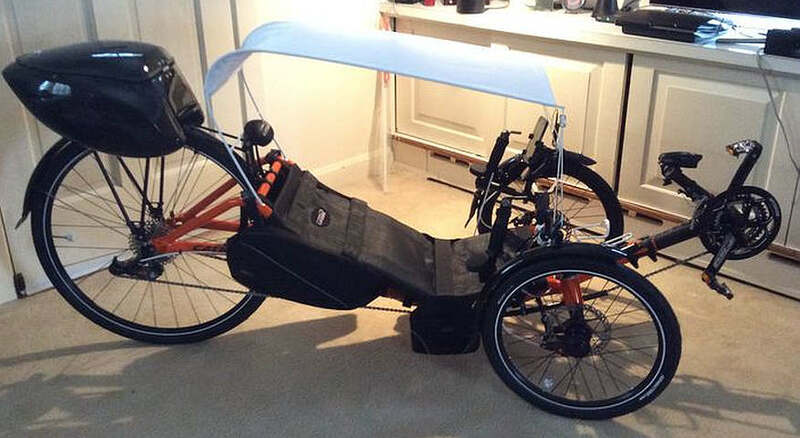 “”Form meets function”- The Recumbent Trike Canopy. Let this site serve as a place for lively chats involving positive equipment design growth where people share their interest and passion relating to recumbent trike canopy equipment. To visit the Facebook page and request to join the group click HERE. It is currently an Open Group meaning that anyone with a FB membership who is logged in can read thru the postings. However, in order to comment or post anything you have to be a member of the group. 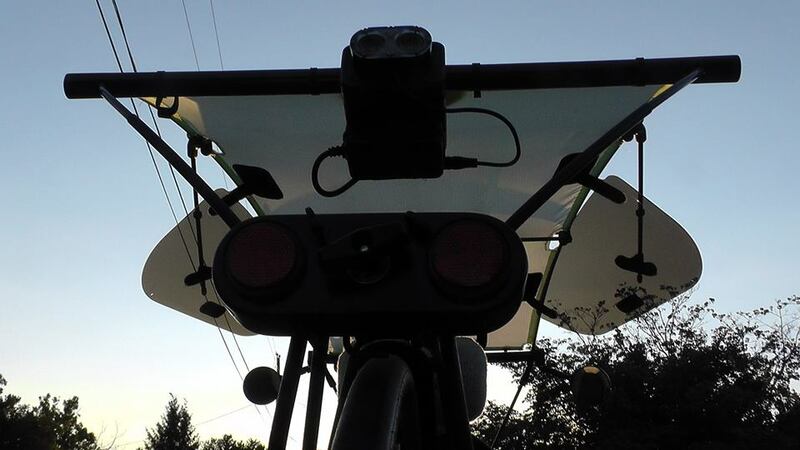 Recently well known tadpole trike rider, Ed Miller has shared a couple of new videos showing the installation of his canopies he is known for. His workmanship always looks impressive. I have posted articles about TRIKE CANOPIES before in which I featured Ed’s canopies among the choices. And HERE is another article I wrote on canopies. Lastly here is another video in which you can see considerable detail of the construction of the canopies and the various options Ed has made availalble. Interested in one of Ed’s canopies? Contact him via email: logbuilder at mindspring.com Just mention ‘canopy info’ in subject line. Ed also has many fine VIDEOS available to watch which I highly recommend as they are always well done and interesting. This is Andy’s personal trike. And here is another one of Andy’s canopies. Andy has several pictures posted of his canopies on Pinterest. Here is one of Ed’s canopies. And here is one of his recent projects … tinted visors. Ed has several videos about his canopies. Several changes have evolved since he started making canopies. The same is true of Andy’s canopies. 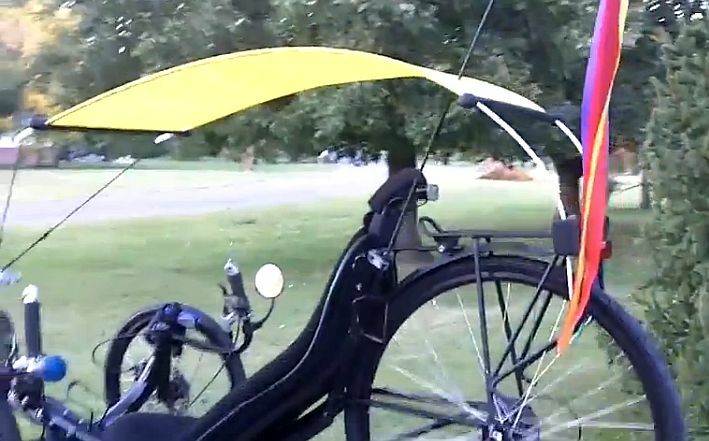 Making these canopies out of a high visibility color contributes greatly to the safety of the trike rider as the canopy really stands out and gets attention. I personally find the idea of carrying your own shade around with you quite appealing. Mind you these mainly provide shade for your upper most body (your head). As far as rain protection they offer limited protection. As to the matter of how they do in wind or at high speed Ed says his do quite well up to normal speeds most riders would obtain. I can’t address how Andy’s canopies do, but I assume they do fairly well. Both Ed and Andy do high quality work and I don’t think you could go wrong regardless of which one you went with. Ed’s Email: logbuilder at mindspring.com Just mention ‘canopy info’. Andy’s Email: NOTE- Andy is no longer making canopies so I am not sharing his email address anymore. Note: I have a more recent article on canopies which offers more information, pictures, videos, and resources. HERE is a link to it. My very first article I wrote and is posted on Steve Greene’s Trike Asylum blog was about trike canopies. Steve Greene was kind and gracious to me in giving his permission to post my articles I wrote on his blog on my own blog and so here is the first of 4 I am posting. 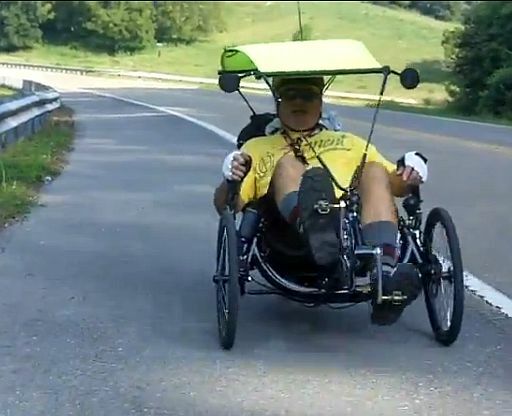 Ed Miller, an avid trike pilot from Tennessee has many fine YouTube videos available of his numerous trike adventures as he rides with his various friends. He rides an ActionBent tadpole trike. I love watching his videos and highly recommend them to you. I personally think they are among the very best I have viewed to date. There is lots of beautiful countryside and wildlife in most of his videos, especially deer. His YouTube username is LogNotching. HERE is a link to all of his videos. He also has come up with some ‘innovations’ including what he refers to as a Trike Hood. It is all about providing shade from the sun and offering a little bit of protection from rain as well. I say little because he would be the first to admit that it offers “little” protection. His design is pretty ingenious in that it is simple, basic yet relatively inexpensive and effective. And it is lightweight which is a concern to most of us. He can readily release the front hook which holds it down horizontally over him so that it stands upright out of the way allowing him to mount and dismount normally. He says it doesn’t effect handling or speed noticably as he has it tweaked in which he explains in one of his videos. logbuilder at mindspring.com Just mention ‘canopy info’. Another item he has made which might be of interest to some readers is a flat platform which serves as a rack for hauling his trike behind his motor vehicle as well as a work stand to perform maintenance, cleaning, etc. and a vertical stand for storing his trike so it takes up less room. And it is made out of plywood so it is fairly simple to make and relatively cheap in cost. Again, he has a video showing and explaining the construction of it. If you get a chance, perhaps on a rainy day when you can’t be out there riding (without a canopy :<), check out Ed’s videos. I think you’ll like them. Check out my more recent article about canopies HERE. It has more information, pictures videos and resources than this older article.